Out of nowhere some people enter into your life and make you realize how beautiful Life is! I wanted to pour my heart out but then whenever I think of you, my soul gets submerged in the magic of your soulful voice. Some emotions are so strong that words fail to express them. They are only meant to be felt and that’s what I do whenever I listen to your songs. Even in my thoughts, you make me feel happy, girl! You are missed and thus come back soon. Right now I am listening your Feel Fine. And your voice stirs my soul every single time. 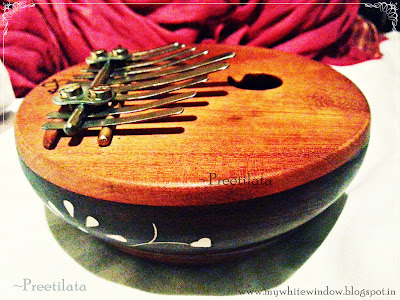 And as I am not suppose to upload your pictures, here I am consoling myself by uploading the picture of your Kalimba. You are a Magician Kamala and this Kalimba is your Magic-wand. Do I need to write that I love you my Dannu Darling? I realize that I had never heard this instrument before, Pree. I had to go and google it to listen to it. Sounds great. 'Feel fine' - the Beatles song? Kalimba is an African musical instrument which my friend bought from India only. I myself did not know about it before she showed it to me. The music that this instrument create is divine more so because she plays it. The song is not by Beatles. It's her own song. Let me see if i could get a link to it. I would love to share it with you all. I too didnt know this but good to know that she is playing it ! Beautiful voice! Thanks for sharing. Awesome music and voice. Enjoyed listening to her sing. My dear Preeti, this is for sure one of the most beautiful gifts someone has given to me.... I am speeachless. Thank you so much! Its been such a universal gift to meet you Love you! And everyone else: Thank you for listening to my songs and appreciating it. It means a lot to me at a moment where I am actually following my hearts desire, wanting to dedicate more time to music. Visiting you from A to Z. Great blog! At first, i thought this post is written for you. Haha.. Well, this is sweet, like what @Roshni written.